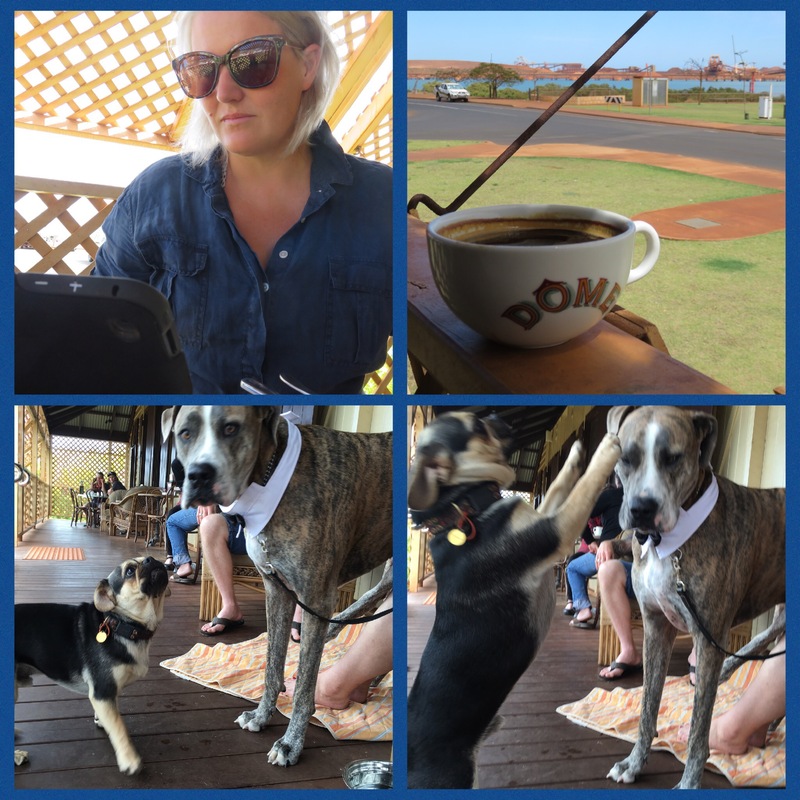 If you find yourself stuck in Port Hedland for a period of time, I have investigated and can report back on the best way to spend a day in the hope that much like Bill Murray, living a perfect day might unlock escape from the town. 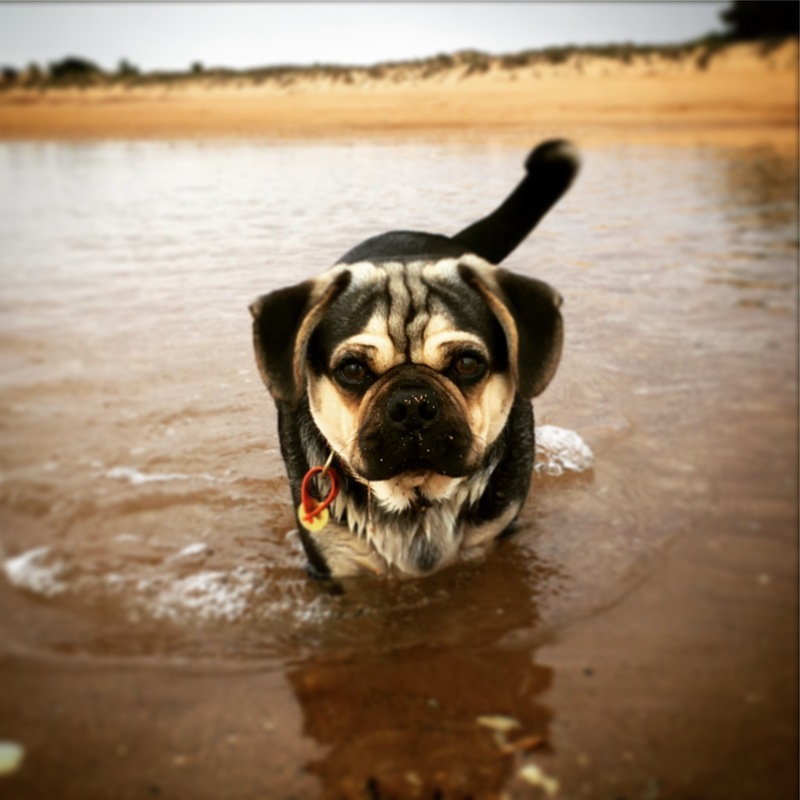 6.30am: Take dog for a walk to Pretty Pool and have a swim. Be warned, if you spend too much time swimming and the tide comes in, you can get marooned on a sandbar and then have to take a very long four-hour walk around the river through Pindan mud closely resembles chocolate mousse to get back to camp. Of course, this does not apply if your dog can just swim across. 9am: Head to Dome Cafe, not something I tend to recommend as a matter of course, however in this instant it is a magic place to watch the ships come in. Important to do this in the morning hours as the afternoon sun is behind the ships, making photographs and general enjoyment somewhat more difficult. It’s in a heritage building that was once nurses quarters and the staff very kindly allow small pug-like creatures to wander around unhindered. You may also encounter other dogs, such as Thor, the Amstaff-Great Dane cross. Free wi-fi means awesome interwebs. 11am: The Courthouse gallery is the workaday home if the magnificent Amy, who is pretty much an artwork in herself. Part Scottish, part English, part Indian, Amy is a henna artist in her spare time (apparently there is quite the demand for it in Port Hedland) and is also passionate about local art. 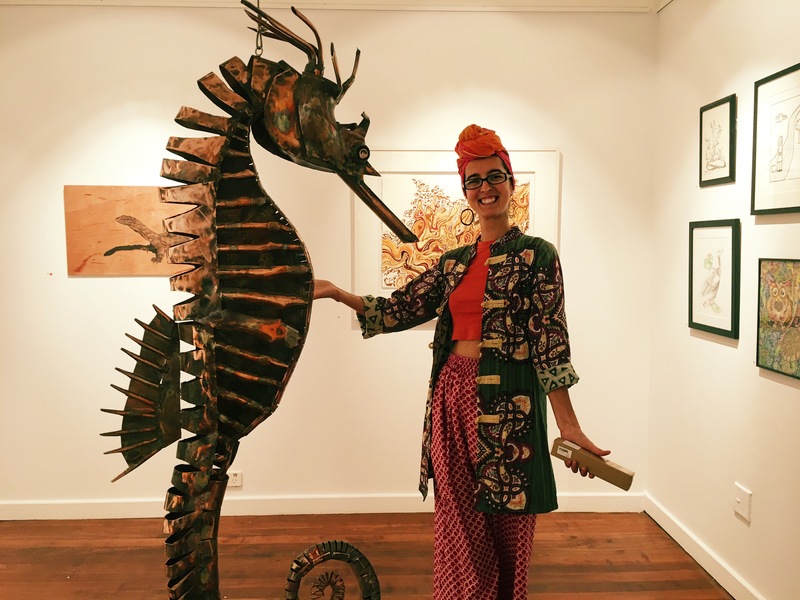 The Port Hedland art award exhibition is on at present and you can vote for your favourite piece – to be honest it was hard to go past a giant metal seahorse, fashioned from left over bits of plumbing by – well – the local plumber. 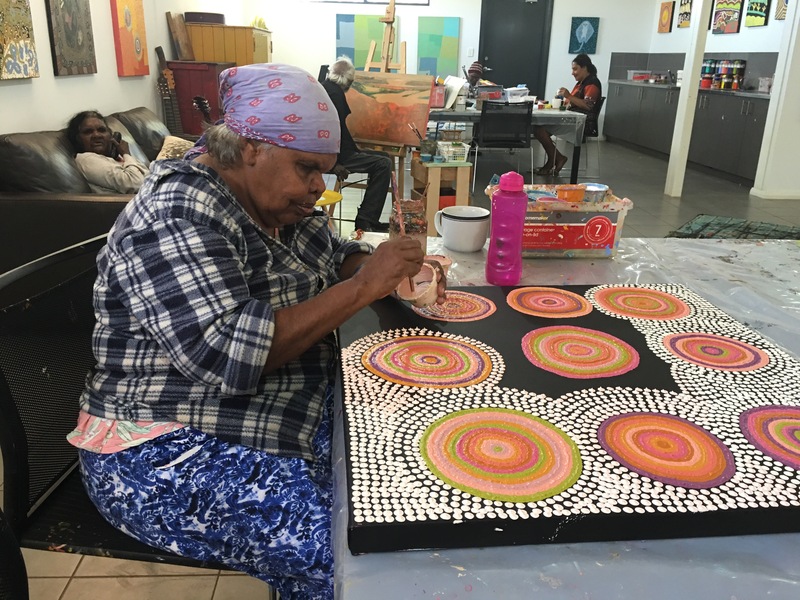 This was painted by Winnie and Amy told me to see Winnie in action, all I needed to do was drop into the Spinifex Hill art centre in South Hedland which is open to the public and where local Indigenous artists hang out and create masterpieces. All good. If you’ve not eaten, the Port Cafe is allegedly quite good and they also have a little cart that takes food out to all the tradies in Wedgefield so that makes them a worthy business to support. 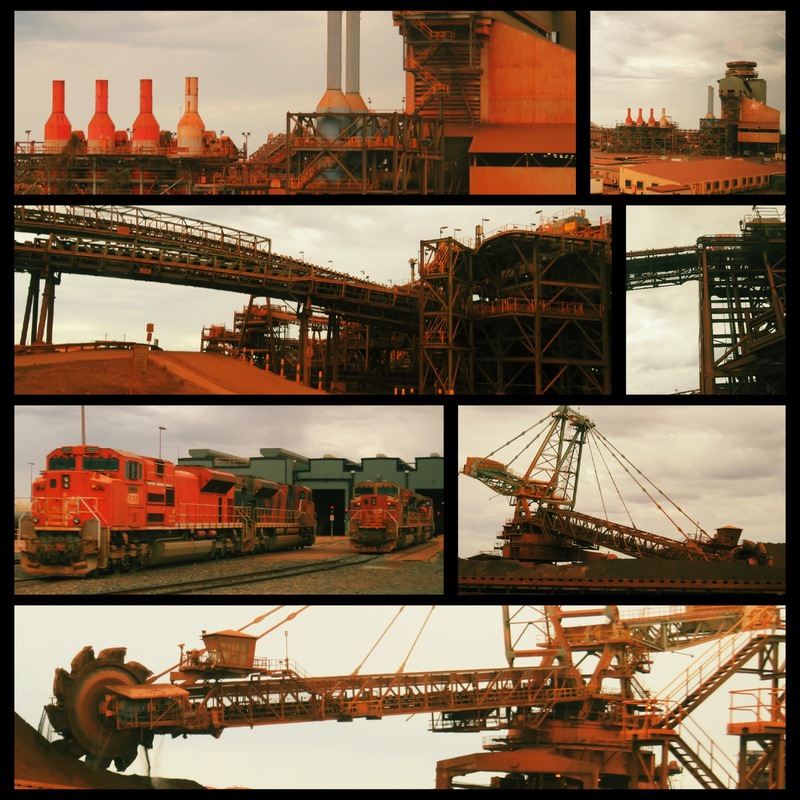 1pm: Port Hedland is full of huge, dusty red metal things. To get up close and personal with said huge, dusty red metal things your best option is to jump a tourbus to BHP Billiton. I have toured their Perth tower which has a disco lift that goes down the outside of the building. The downside is, typical of BHP, you are not allowed off the bus meaning all photographs must be taken through grubby windows. I did provide feedback that cleaning the windows for a visual tour might be a good thing to do, so for you dear reader the situation may not be so dire. The tour guide will spout many numbers at you that defy true appreciation, like by putting ridges on the inside of ore carrying train carts, BHP saved $1 million per train, and with 50 trains, that was $50m per year. 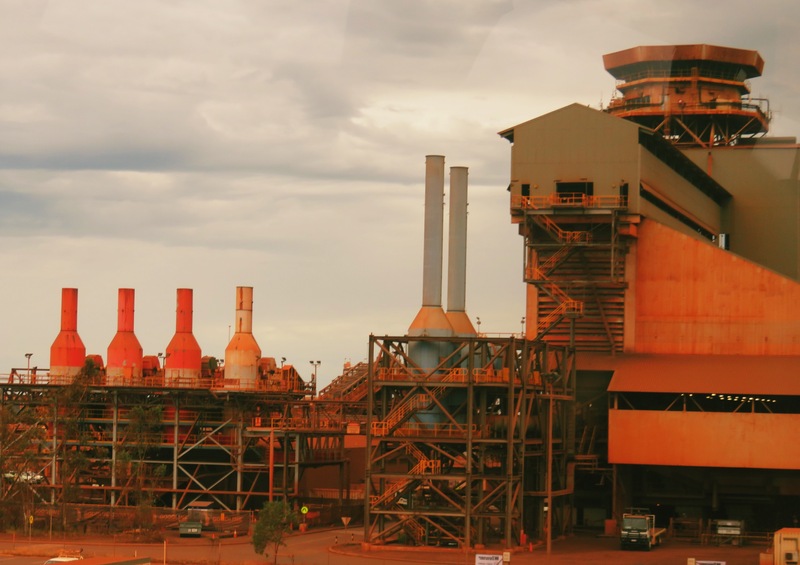 She also said the mining boom wasn’t over – just the construction phase of it was and BHP continues to export record amounts of iron ore through the Port. Oddly, the falling value of iron ore was not mentioned. 2.30pm: Take a drive to South Hedland past the stadium which is commonly known as the Lego building. I was told this and didn’t think much of it until I saw the building and thought “yep, Lego building”. The carpark for Spinifex Hill is shred by the local South Hedland vet. We went into the latter to help Zeus overcome his deathly fear of vets and met a Husky called Lola and she was magnificent. Across the park is the art workshop and hangout of the artists of Spinifex Hill. 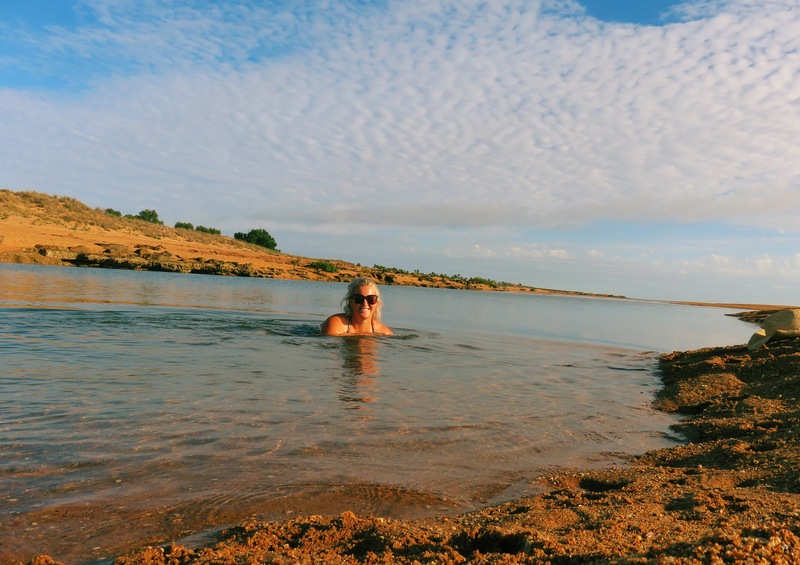 Maggie Green was busy painting waterholes she swam in as a child, but stopped to pat Zeus with glee, declaring if she could that she’d have 20 dogs. One of Maggie’s paintings has been turned into a fabric print and retails back at the Courthouse gallery as a scarf. 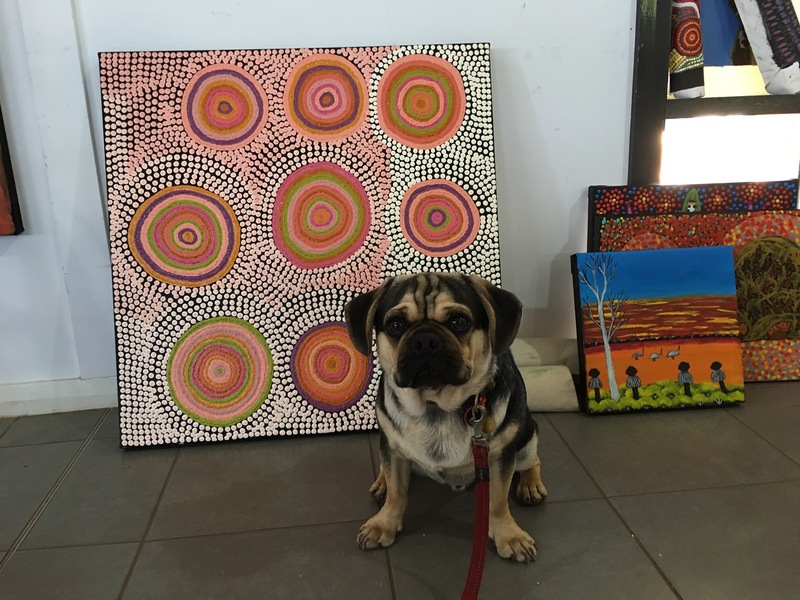 On the next table, Winnie was working patiently on a Pilbara landscape. She said she is a slow painter, but I thought she was also incredibly talented. 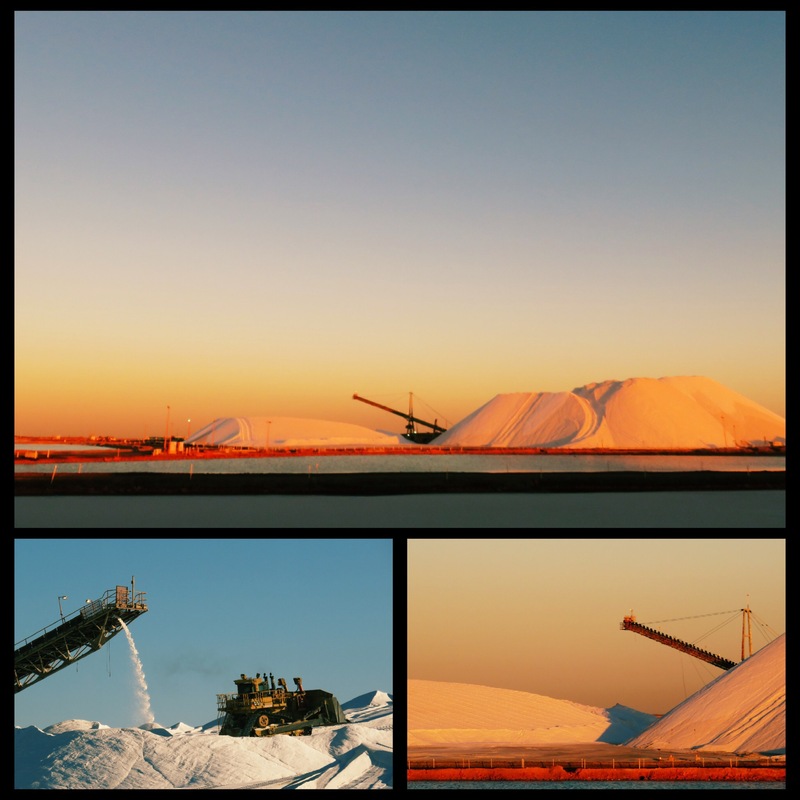 5.30pm: as the sun sets, it’s time to go check out the giant pile of salt between Port and South Hedlands and watch the colours change as the sun sinks. I was amused to see some wag had put what looked like shark fins in a circle out in one of the salt flats. 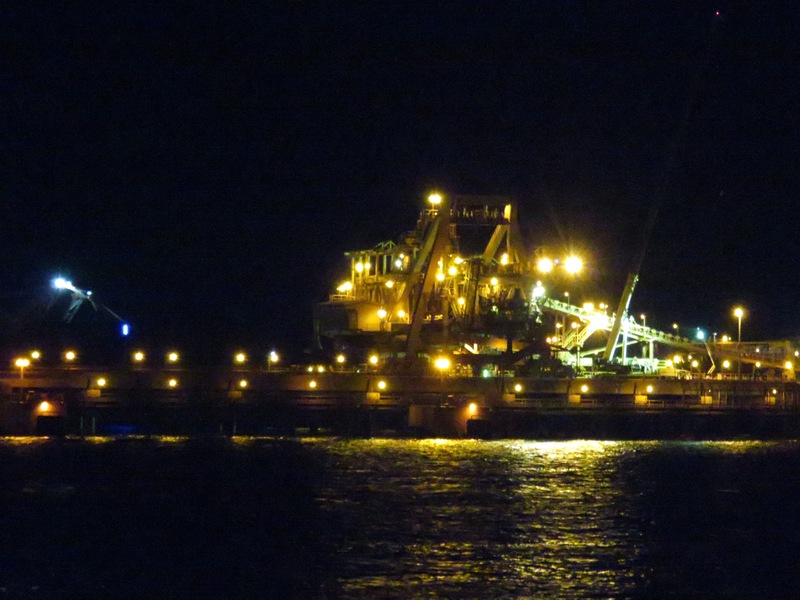 Just more big machinery really but Dampier Salt has thoughtfully put in a viewing platform on the overpass to check it out from. 6.30pm: there is a little take away place called Yummy Noodle and they do a great Yummy Noodle special, which you can take back to the port to eat whilst watching the lights come on and the ships roll past in the dark.